Cite page (MLA): Kumari, Ashanka, and Adrian S. Wisnicki. "A Brief History of Livingstone Online (2004-2013)." Livingstone Online. Adrian S. Wisnicki and Megan Ward, dirs. University of Maryland Libraries, 2015. Web. http://livingstoneonline.org/uuid/node/85a0a40c-9dfc-4167-aff4-0797f78db4c0. This essay explores the origins of Livingstone Online, describes the goals and achievements of the project's first phase (2004-06), considers how these goals changed as the site grew and gained more collaborators during its second phase (2007-09), and, finally, outlines how Livingstone Online expanded into an international project while embracing advanced imaging technology for the study of Livingstone's manuscripts (2010-13). Livingstone Online started as a pilot project with a broader aim. In 2004, a small group of scholars at the Wellcome Trust Centre for the History of Medicine at University College London began to investigate the ways in which nineteenth-century medicine and science advanced the nationalist aims of exploration and colonization. In particular, while pursuing an interest in the history of surgery, Professor Chris LawrenceChris Lawrence (Professor Emeritus, University College London). Former director of Livingstone Online; now director emeritus of the project. 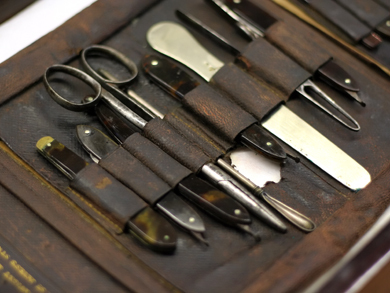 realized that nineteenth-century surgeons often relied on strategies of self-representation that mirrored those used by nineteenth-century explorers. For instance, both sets of men (they were usually men) sought to portray themselves as masculine heroes, as individuals entering “unknown territory,” and so forth. Lawrence, therefore, hoped to launch a more extended comparison of the two groups. The preliminary Livingstone Online team consisted of Lawrence as director, associate director Janet BrowneJanet Browne (Aramont Professor of the History of Science, Harvard University). Former associate director of Livingstone Online; now senior advisor to the project., research assistants Sharon MessengerSharon Messenger (Wellcome Trust Centre for the History of Medicine, University College London). Research assistant for Livingstone Online. and Caroline OveryCaroline Overy (Wellcome Trust Centre for the History of Medicine, University College London). Research assistant for Livingstone Online., and programmer Michael HawkinsMichael Hawkins (University of Sussex). Web developer for Livingstone Online.. The team sought to design and build an online scholarly resource that conformed to academic electronic publishing best practices and that offered its users something more than a traditional, print-based resource. The resource would include rigorous transcriptions and high-resolution images of original archived materials along with editorial annotations and text searching capabilities. The team decided to focus on letters from English-speaking, nineteenth- and twentieth-century explorers, particularly those with connections to medicine and science. To test the feasibility of this larger project (tentatively titled “Medicine and Exploration”), the team determined to examine the medical and scientific content of the 2,000+ letters that David Livingstone had written during his life and to investigate how this content could be made accessible. Preliminary research showed that there was no definitive edition of David Livingstone’s letters: a few were published in scholarly format; others were unpublished or published in incomplete or poorly edited forms. There was, however, an invaluable catalogue of the letters and other manuscripts and their locations. In addition, a number of particularly well known libraries and archives in Britain and Africa had substantial holdings of original Livingstone material. The team chose to confine the project to letters because of the special relationship of letters to the private and public realms, and because of the role letters played in linking the metropolitan center and the colonial field. In particular, the team took interest in how the edited letters would illuminate the use of western medicine and science in south and central Africa in the nineteenth century, both as practical tools of exploration and as cultural instruments of colonization. The pilot phase of Livingstone Online began on 1 August 2005, thanks to a grant from the Wellcome Trust, and the site went live on 5 May 2006 publishing a selection of nearly 70 Livingstone letters from the Wellcome Trust Library as well as a handful from the National Library of Scotland. These letters had been chosen because they were relatively short and so offered the team, many of whom were new to electronic publishing, the opportunity to develop the appropriate skills in a fairly controlled environment. University College London agreed to host the site, while the project itself took up headquarters at the Wellcome Trust Centre for the History of Medicine. After the success of the pilot project, the Livingstone Online team shifted its overriding goal to publishing a wide range of Livingstone letters. This decision arose from recognizing that Livingstone's manuscripts offered an ideal source for studying the integration of science and medicine into the colonizing process and, more practically, from a decision to develop the project in a way that funding bodies would find feasible and so support. Indeed, during this time the team successfully applied to the Wellcome Trust for a substantial three-year grant. Gary LiGary Li. Photographer for Livingstone Online. joined the team as photographer, and a new phase of the project launched in January 2007. A different goal determined the work for each year of this new grant. In the first year, the Livingstone Online team planned to identify the key Livingstone medical and scientific letters at the National Library of Scotland and to transcribe, edit, and publish each of these as well as all 40 Livingstone letters at the David Livingstone Centre, Glasgow. During the second year, the team hoped to turn to other UK libraries and archives with significant Livingstone holdings: including SOAS, the Royal Geographical Society, and the Rhodes House Library, Oxford. The team set aside the third year for the collection of relevant Livingstone materials from archives with smaller collections including libraries abroad. During these years, the team also planned to convert and update the Clendennen and Cunningham catalogues (1979, 1985) into an integrated, searchable, online database. A series of key developments, therefore, marked this phase of the project. In February 2007, Livingstone Online established an advisory board that balanced scholarly, archival, and technical expertise and that consisted of Pietro CorsiPietro Corsi (Professor, University of Oxford). Advisory board member for Livingstone Online., Felix DriverFelix Driver (Professor, Royal Holloway, University of London). Advisory board member for Livingstone Online., Mark HarrisonMark Harrison (Professor, Wellcome Trust Centre for the History of Medicine, University College London). Advisory board member for Livingstone Online., Rob IliffeRob Iliffe (Professor, University of Sussex). Advisory board member for Livingstone Online., and Murray SimpsonMurray Simpson (Manager of Manuscript Collections, University of Edinburgh Library). Advisory board member for Livingstone Online.. In December 2007, the team released the online version of the Clendennen and Cunningham catalogues. Concurrently, Livingstone Online published images and/or transcriptions of the Livingstone holdings from a succession of institutions: the Royal College of Physicians and Surgeons of Glasgow; the Royal Society; the Royal Society for the Encouragement of Arts (RSA); the National Library of Scotland; the Royal Botanic Gardens, Kew; the John Murray Archive; the John Rylands Library; and the Royal Geographical Society. Regular announcements and, later, a blog kept the public apprised of project developments. By the end of the three-year grant phase in 2009, the Livingstone Online team could claim a number of accomplishments. The team had developed a robust website supported by a well-developed database. Livingstone Online had published nearly 500 Livingstone manuscript items as either rigorous transcriptions and/or high-resolution images and, moreover, had collected several hundred images and a large number of transcriptions yet to be put online. Finally, the team had also published several critical essays on Livingstone’s life and times and had discovered almost 30 previously uncatalogued original manuscript items – some of them found by going through the telephone directory looking for descendants of people to whom Livingstone had sent letters whose current whereabouts were unknown. Thanks to these elements, the site had become a significant public education resource and, indeed, the project team regularly fielded queries from the public. In addition, the pilot and the three-year project enabled the team to hone the principal scholarly objectives of Livingstone Online: “Our key goal is to make David Livingstone documents available to a worldwide audience and to use them to study medicine and science in nineteenth century Africa. Research [involves] contacting and usually visiting institutions holding David Livingstone letters. These [are] verified as authentic, scanned, transcribed and published (as both originals and transcriptions) in diplomatic form (that is with all variant reading included). They [are] edited with high quality scholarly mark up (footnotes) of the sort found in definitive editions of letters published in book form” (Livingstone Online, Modified Version of “Stage Two Grant Application” to the Wellcome Trust). Unfortunately, 2010 witnessed the beginning of the controversial closing of the Wellcome Trust Centre for the History of Medicine and with it the end of hopes for a second Wellcome Trust grant. The complications in funding and personnel, therefore, threatened to end the work of Livingstone Online. However, since inception, Livingstone Online had placed special emphasis on its collaborative relationships. These relationships extended from institutions with major and minor Livingstone holdings to individual scholars, whom director Chris LawrenceChris Lawrence (Professor Emeritus, University College London). Former director of Livingstone Online; now director emeritus of the project. encouraged to contribute to Livingstone Online and otherwise assisted by means of the project. One such scholar, Adrian S. WisnickiAdrian S. Wisnicki (Assistant Professor, University of Nebraska-Lincoln). Director of Livingstone Online, LEAP, and the Livingstone Spectral Imaging Project. (then at Birkbeck, University of London), had joined the team in 2009. Wisnicki found the archive in his search of letters from the last phase of Livingstone’s career and, in doing so, also found an intellectual community in Lawrence and the other team members. Once on board, Wisnicki began to discuss with Lawrence a project to publish Livingstone’s final field diaries (1866-1873). Full, unabridged publication of these diaries had eluded scholars for decades. Wisnicki hoped to begin this project by focusing on a particularly damaged diary, Livingstone’s 1871 Field Diary. Research on this diary, in collaboration with Debbie HarrisonDebbie Harrison (Senior Visiting Fellow, The Pensions Institute, Cass Business School). Former scholar for the Livingstone Spectral Imaging Project; now advisory board member for Livingstone Online. (Wisnicki’s colleague at Birkbeck), an American team of spectral imaging scientists, and the UCLA Digital Library eventually resulted in the Livingstone Spectral Imaging Project (2010-present), a major Livingstone Online-affiliated initiative funded by the National Endowment for the Humanities (USA) and the British Academy. The Livingstone Spectral Imaging Project cemented WisnickiAdrian S. Wisnicki (Assistant Professor, University of Nebraska-Lincoln). Director of Livingstone Online, LEAP, and the Livingstone Spectral Imaging Project.’s relationship with Livingstone Online and resulted in an invitation from LawrenceChris Lawrence (Professor Emeritus, University College London). Former director of Livingstone Online; now director emeritus of the project. in 2010 to co-direct the main Livingstone Online site, which had now become publicly dormant. Between 2010 and 2013, then, Lawrence and Wisnicki explored a variety of options for continuing the work of Livingstone Online, including the possibility of relocating the site to Birkbeck. Both individuals recognized the significance of the work that the Livingstone Online team had already accomplished and the need to sustain this work in the long-term manner. Behind the scenes, the transcription of Livingstone’s letters continued, led by current head research assistant Heather F. BallHeather F. Ball (Project Cataloger, The Morgan Library & Museum). Coordinating project scholar for Livingstone Online., whom Wisnicki had recruited to Livingstone Online, and carried out by a number of Wisnicki’s students (notably A.J. SchmitzA.J. Schmitz (Graduate Student, Indiana University of Pennsylvania). Research assistant for Livingstone Online.) at his new institution, Indiana University of Pennsylvania (IUP), as well as scholars elsewhere, including Kate SimpsonKate Simpson (Graduate Student, Edinburgh Napier University). Project scholar and UK outreach coordinator for Livingstone Online. (Edinburgh Napier) and Jared McDonaldJared McDonald (Lecturer, University of the Free State). Associate project scholar and lead contact for South African research for Livingstone Online. (then SOAS). Moreover, at IUP, Wisnicki in collaboration with student programmers Adam ColtonAdam Colton (Graduate Student, Indiana University of Pennsylvania). Web developer for Livingstone Online. and Annie LinAnnie Lin (Undergraduate Student, Indiana University of Pennsylvania). Web developer for Livingstone Online. began to convert the site to the Drupal content management system, with an eye to migrating Livingstone Online as a whole to the UCLA Digital Library. During the years 2010-13, consequently, the Livingstone Online team remained quite active, despite the project’s public silence and the lack of significant funding for the site itself. The team itself took on an ever-expanding international character that reflected the continuing international interest in Livingstone’s manuscript legacy. Moreover, the team’s work began to lay the groundwork for the long-term sustainability of the site and ensured that the stage remained set for a significant grant to support the next phase of the project’s development.